Nephew of Slain Gay Icon Harvey Milk: Orlando Massacre Marks One of the LGBT Movement’s Darkest Days | Democracy Now! nephew of gay rights pioneer Harvey Milk. He is the co-founder and president of the Harvey Milk Foundation. The FBI investigation into the Orlando shooting massacre that left 49 people dead at a gay club has taken an unexpected twist after evidence emerged the gunman was a regular patron of the Pulse nightclub. The FBI has begun investigating multiple claims that the shooter, Omar Mateen, might have been gay himself and regularly frequented the Pulse nightclub. The claims have come from numerous people, including his ex-wife, a former high school classmate and several patrons of the Pulse nightclub. In the wake of the deadliest attack on the LGBT community in U.S. history, we speak to Stuart Milk, the nephew of gay rights pioneer Harvey Milk, one of the first openly gay politicians in the United States. Harvey Milk was assassinated in 1978, a year after winning election to the San Francisco Board of Supervisors. He was gunned down along with San Francisco Mayor George Moscone by a former city supervisor. Stuart Milk is the co-founder and president of the Harvey Milk Foundation. AMY GOODMAN: The FBI investigation into the Orlando shooting massacre that left 49 people dead at a gay club has taken an unexpected twist after evidence emerged the gunman was a regular patron of the Pulse nightclub. On Monday morning, FBI Director James Comey said the shooter, Omar Mateen, was likely radicalized online, but that no evidence has emerged he received outside help in the attack. JAMES COMEY: So far, we see no indication that this was a plot directed from outside the United States, and we see no indication that he was part of any kind of network. It is also not entirely clear at this point just what terrorist group he aspired to support, although he made clear his affinity at the time of the attack for ISIL and, generally, leading up to the attack, for radical Islamist groups. AMY GOODMAN: During a phone call to police Sunday morning, Omar Mateen expressed support for the self-proclaimed Islamic State, but Comey said at other times he also expressed solidarity with groups fighting against ISIS, like Hezbollah and al-Nusra Front. On the presidential trail, Donald Trump used the shooting to call for expanding his proposed ban on immigrants entering the United States, while Hillary Clinton called for ramping up the air campaign against ISIS. However, more evidence is emerging that the gunman who attacked the gay nightclub may have had a very different motive. The FBI has begun investigating multiple claims that the shooter, Omar Mateen, might himself have been gay and frequented the Pulse nightclub. The claims have come from numerous people, including his ex-wife, a former high school classmate and several patrons of the Pulse nightclub. One Orlando resident named Cord Cedeno spoke with MSNBC’s Chris Hayes about the gunman. CHRIS HAYES: —like, he is familiar to you from gay dating apps and from the gay club? CORD CEDENO: Yeah, no, one of my friends has seen him in Pulse before. He’s been in that venue several times. That’s not his first time going there. I know that for a fact. He clearly had his picture open on Adam4Adam. He’s had his picture up on Grindr. In Jack’d, he’s had his pictures up on there. And then, I think one of them he didn’t have his pictures up, but he would send them to guys. I know there’s plenty of other guys that he has probably tried to contact and hook up from. A lot of them are scared to come out and tell the FBI. Two of my friends already went to the FBI, and they already spoke with them, they already turned in their phones, and they already got all their information. AMY GOODMAN: Cord Cedeno, speaking on MSNBC. Two of his friends were killed inside the gay nightclub on Sunday. Orlando authorities say 49 people died in total, the vast majority young and Latino. On Monday, thousands gathered in downtown Orlando for a candlelight vigil to remember the victims. A nearby church bell tolled 49 times—once for each victim. We begin today’s show with Stuart Milk, the nephew of gay rights pioneer Harvey Milk, one of the first openly gay politicians in the United States. Harvey Milk was assassinated in 1978, a year after winning election to the San Francisco Board of Supervisors. He was gunned down along with San Francisco Mayor George Moscone by a former city supervisor. Stuart Milk is the co-founder and president of the Harvey Milk Foundation. We welcome you to Democracy Now! Talk about what took place in Orlando and how you link this to the legacy of your uncle, the famed gay rights activist Harvey Milk. STUART MILK: Well, Amy, all of the elements, actually, that you’ve been talking about this morning are linked to my uncle. It’s the elements of our visibility, the elements of violence that are perpetrated against LGBT people, the elements of the use of guns in the U.S. to assassinate and to—and to commit violence on minority communities, and even the element that was—that you have mentioned today, which is of no surprise to LGBT activists around the world, that this individual may have himself been dealing with his own sexuality. And we have seen time and time again that those who come from cultures and who come from societal nonacceptance of LGBT people, that oftentimes they react angrily, and that internal torment gets expressed externally through either verbal or physical abuse and, in extreme cases, something like what we saw happen to a community that I happen to be very close to. The Harvey Milk Foundation plays a significant role in the Orlando community. These are—it’s a community that I have seen just absolutely blossom in their acceptance of not just LGBT people, but of diversity in general. It is, you know, what has been known as the happy—one of the—the happiest place, by the slogan, on Earth, has now become very, very dark. But they will get back to where they are—where they had come from. AMY GOODMAN: We’re speaking—Stuart Milk, we’re speaking to you in Florida, in Fort Lauderdale, Florida. In a tweet that went viral after Sunday’s attack on the LGBT nightclub in Orlando—and I quoted is yesterday, but I think it’s very important to continue to raise—ACLU staff attorney Chase Strangio wrote, “The Christian Right has introduced 200 anti-LGBT bills in the last six months and people blaming Islam for this. No,” he wrote. Your response? STUART MILK: Yeah, I mean, the religious extremists of any religion have had shopping lists of people, and LGBT people are usually front and center. The Harvey Milk Foundation, we do work globally. And I can tell you that in a huge number of places in the world, we are still facing Judeo-Christian extremists. I’ll be, tomorrow, heading off—tonight, actually—to the Baltic states. And the type of extremism that diminishes not just LGBT people, but the role of women, the role of other minorities and other cultures, is still coming from the Judeo-Christian religion, so—of the extreme right. All those extremists have a agenda of separation and division. And what that means for our young people and people who struggle with their sexuality is that they are torn. And what we—the result that we have seen here of any type of extremism is violence. But to then turn a dark—one of the darkest days that the LGBT movement has in modern history and to try to make that into a case to discriminate against another culture, a culture that’s a minority in this society, is simply unacceptable. And I can tell you that the LGBT community and the LGBT leadership, not only in the United States, but around the world, we are not going to allow that to happen. AMY GOODMAN: Stuart Milk, tell us about your uncle. Tell us about Harvey Milk, the gay rights pioneer. STUART MILK: Well, you know, Harvey’s dream—and it wasn’t Hollywood. This was—you know, he was up against so much opposition to his message, which was that we must be visible, that we must be out, that we must take our masks off, that we must be authentic. And by the way, the message was not just for the LGBT community, it was for anyone who was hiding who they were, what their background was, what their culture was. But his message was, in terms of society, simply unheard of. So, not only was he one of the first openly gay elected officials, but he was really the first person to publicly and consistently call for our visibility. He believed that if we were not at the table, we were on the menu. He believed that if we were not visible to our families, to our friends, to our neighbors, then all the lies and myths and innuendos would be out there. STUART MILK: —acceptance of those that are different. AMY GOODMAN: I wanted to turn to a part of a speech delivered by your uncle, Harvey Milk, in 1978. At the time, he was an openly gay member of the San Francisco Board of Supervisors. HARVEY MILK: We must destroy the myths once and for all, shatter them. We must continue to speak out. And most importantly—most importantly, every gay person must come out. As difficult as it is, you must tell your immediate family, you must tell your relatives, you must tell your friends—if indeed they are your friends—you must tell your neighbors, you must tell the people you work with, you must tell the people in the stores you shop in. And once they realize that we are indeed their children and we are indeed everywhere, every myth, every lie, every innuendo will be destroyed once and for all. And once—once you do, you will feel so much better. AMY GOODMAN: That was Harvey Milk in 1978. And he also wrote a note, if, he said, he was assassinated, that he wanted people to know. Is that right, Stuart Milk? STUART MILK: —tape recordings, where he said, “Let the bullets that smash through my brain smash through every closet door.” He wanted—he knew that—he had death threats constantly, and he knew that he was going to be assassinated. He didn’t know who, and he didn’t know when. But he—and not only in terms of that tape recording, but letters to the family. And I can tell you that he wanted those bullets to be the last violence towards the LGBT community, the last violence towards any minority group. So, I can tell you it’s with a heavy heart that we’re here discussing this situation. There are so many elements to this that we need to continue to talk about. But we cannot go backwards. There are young people who are going to be afraid, who are going to be afraid all around the world, to go into a club, which are safe spaces for the LGBT community, not just in the U.S., but all over the world. These are, in many ways, our community centers. They have historically been for years. And these young people are going to—are going to have this hesitation. And we must get the message out. We have moved too far forward to allow anything as dark as this to move us backwards. And we must get the message out that they must continue to be authentic. We need who they are. We need who they are. We need their differences. We need their authenticity for us to all prosper. AMY GOODMAN: I want to thank you, Stuart Milk, for being with us, nephew of gay rights pioneer Harvey Milk, co-founder and president of the Harvey Milk Foundation, well-known Florida gay rights activist. This is Democracy Now! 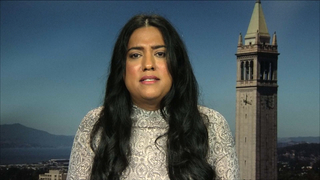 When we come back, we speak with a leading trans activist. The bar, the Pulse, was an LGBT watering hole, a cultural space, a place of gathering and sanctuary. Overwhelmingly, the number of people killed, the 49 people, were Latino and Latina, many of them Puerto Rican. Stay with us.